It may not be common knowledge, but ice hockey is one of my favourite sports. 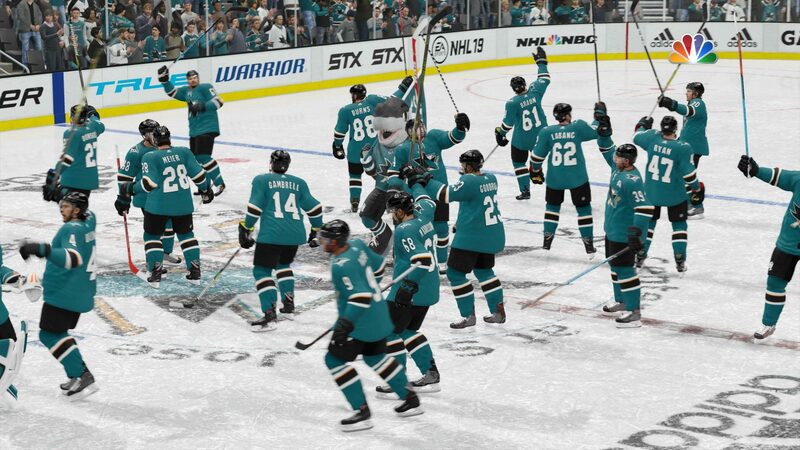 I’ve been a fervent fan of the San Jose Sharks for over 20 years, travelled to America to watch them play, and won them countless Stanley Cups over a number of NHL games. Aside from the Resident Evil series, the NHL games were the go-to games during my formative years, in fact I was borderline obsessed with the sport and games, with the games convincing me that I would go on to play in the NHL (let’s ignore the fact that I am 5’6 and lived nowhere near an ice rink). I scribbled stats upon stats in notebooks and folders, detailing every bit of each of my dynasties like a fanatic. However, as the years went on and time became an expensive currency, my time on the ice was cut to the occasional shift, eventually only purchasing NHL every couple of years. While I’ve flirted with the NHL titles recently, they haven’t sucked me in like the games of yore did. I told myself that this year would be the year that I invested more than a handful of hours into the title, and as a result I am well and truly back on the bandwagon, as NHL 19 is one the best-crafted sports experiences in recent times. While most people assume that NHL games are simply about putting the puck in the net, there’s a lot more to NHL 19 than that…like playoff beards. 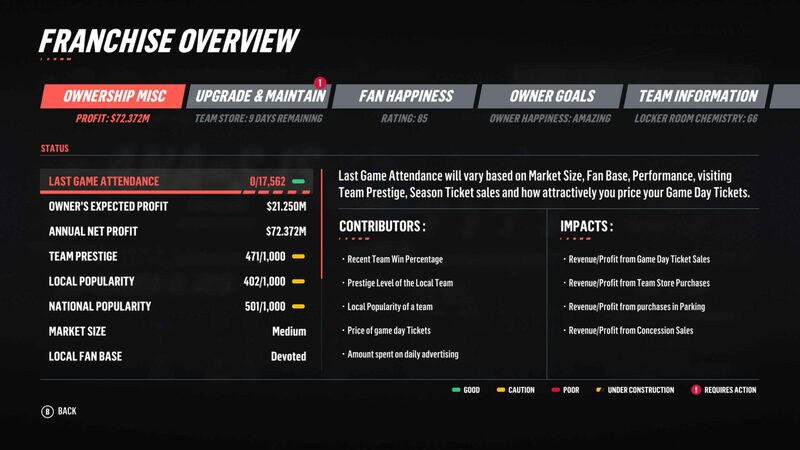 There are also things like allocating giveaways and promotional nights and making sure your players are feeling the love while playing Franchise Mode, or touring the NHL Threes circuit. In short, there’s a lot more to do than just hitting the ice, and most of it is well worth a look. However, this is coming from someone who hasn’t played much more than a handful of hours in recent years, and given the changes to NHL 19’s predecessors are minor, there may not be a lot here every veteran to dive in. 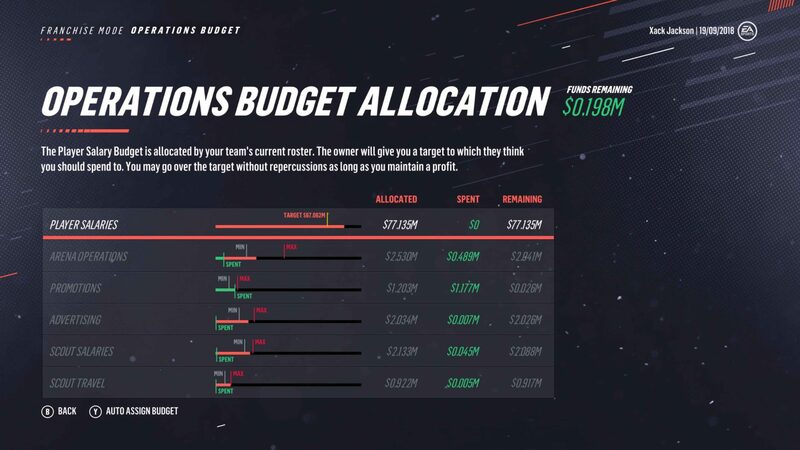 One of the biggest drawcards for the NHL games is just how much control you’re afforded in Franchise Mode. The NHL games have always had a deep management system in their games, allowing you to control practically every aspect of your team’s off-ice operation. Think Football Manager, but not quite as in-depth. 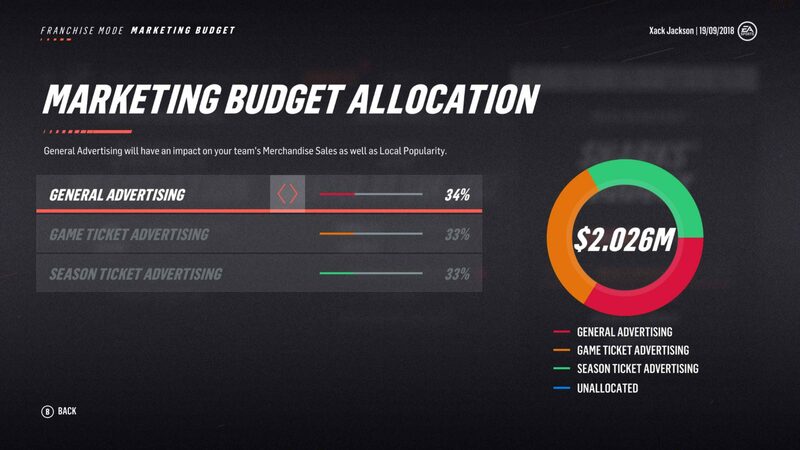 As your team’s GM, you’re able to control things like ticket prices, budget allocations and promotional giveaways (such as a bobblehead night). 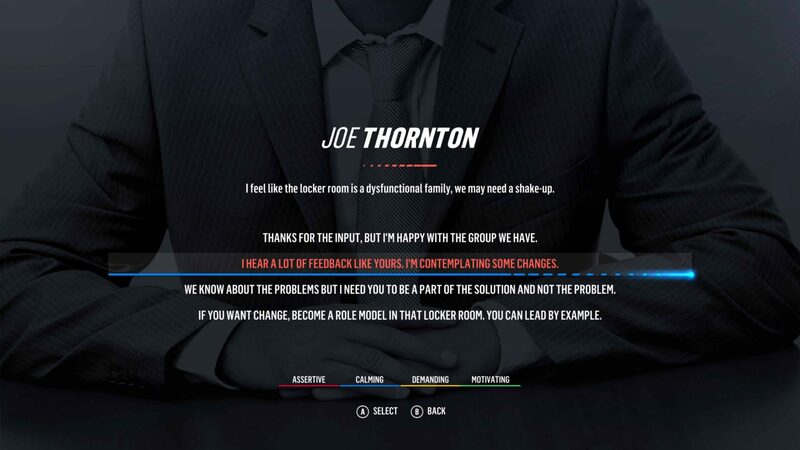 You’re also in charge of contract and trade negotiations, as well as where you send your scouts (including the new Fog of War feature that hides a player’s true rating if you haven’t put enough time into them), meaning that you get to shape your team as you would like. This also comes with accountability; if your team underperforms or you fail to meet the owner’s goals you can be given the arse (a feature that can be disabled, but where’s the fun in that?). While off the ice NHL 19 is laden with features, on the ice holds up its end of the bargain too, with one of the more responsive and satisfying releases from a gameplay perspective. Most of the formula from recent years is present but has been improved to deliver the best gameplay experience thanks to enhanced controls and animations. Everything feels smooth, from skating past your opponent to delivering that perfectly weighted saucer pass to put your team in a perfect scoring position. Although, I’m still no maestro of the Skill Stick. Furthermore, the bodycheck physics have been upgraded, with every bone-crunching hit felt through the controller. There’s an impressive amount of teams from various leagues across Europe and North America, including leagues from Germany, Czech Republic, Switzerland and popular leagues such as the American minor leagues. EA has also included a huge number of hockey legends (Gretzky and co.) for players to play as. Or if you’re into player creation there’s a fairly robust player creation tool as always. Another highlight (again) is the returning Threes mode, an arcade mode where two teams of three battle it out with varying match conditions such as double goal-worthy money puck and setting the winning score (first to five, win by two, etc.). It’s a great mode to pick up and play should you not want to invest in the game’s deeper offerings, plus you get to play with NHL team mascots skating in the line-up. It reminds me of how much I’d love EA to bring back NHL Rock the Rink. The online facet has also been given a facelift, with the new World of Chel (pronounced as the L (chel) in NHL) allowing players to level up their character across a number of modes including the new Ones mode, which lets players play old-fashioned pond hockey (literally) against two other skaters (1v1v1). Players can customise their look from a wide range of options, ensuring that they look good while on the ice. The only downside is that it’s limited to NHL’s online service, whereas a local mode would have been a boon to the declining couch co-op landscape. However, perhaps the most impressive aspect of World of Chel is that it features no microtransactions. There’s also the NHL-flavoured Ultimate Team, Be A Pro and Champions League modes for those who like to engage in those shenanigans. The game’s production also gets a stick tap of approval, with matches presented in broadcast-like detail thanks to NBC Sports commentators Eddie Olczyk and Mike Emrick delivering expert commentary and pre-game analysis. 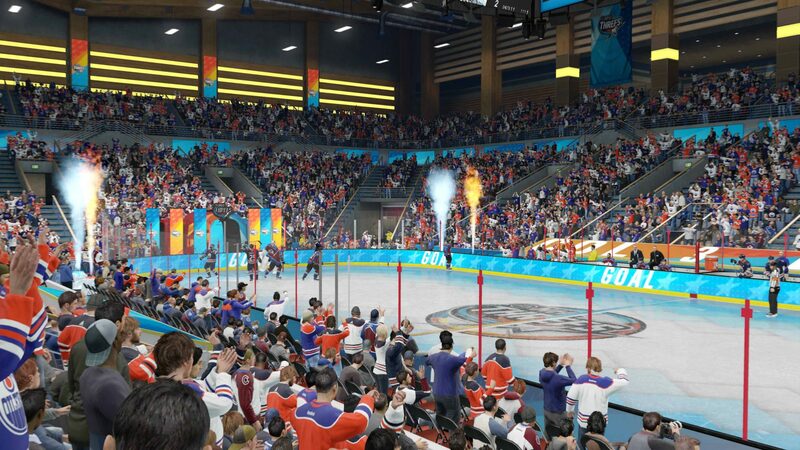 Visually, the game is top-shelf, with player models, mascots, fans, stadiums and Zambonis all rendered with impressive detail thanks to EA’s Ignite Engine. Although the soundtrack still doesn’t match up to the bangers of NHL 2001, such as ‘Lemons Are Nice’. Call me sour, but Imagine Dragons and Panic! At the Disco don’t get the motivational juices flowing like the soundtracks from the CD-dominant era did. It’s been many years since an NHL game has captivated me to the extent that I have invested deeply into it. But with a slew of fun modes, the in-depth Franchise mode, and coupled with impressive controls and gameplay, NHL 19 has convinced me that being back on the ice is where I belong. However, for seasoned veterans the upgrade appeal may be limited, with only minimal changes to the series’ formula.